The Healthy Exchange Project collaborates with city government and community-based organizations to implement nutrition education with the goal of ensuring that every New Yorker knows how to use the resources available at Greenmarket and make the most of their farmers market purchase. Nutrition education and cooking demonstrations are as much a part of coming to the Greenmarket as shopping for high-quality fruits and vegetables grown in the New York region. The NYC DOHMH’s Stellar Farmers Markets program provides free, bilingual nutrition education and cooking demonstrations at select farmers markets throughout NYC from July to November. This initiative promotes the benefits of a diet rich in fruits and vegetables and improves the capacity of New Yorkers to prepare healthy meals using locally grown, seasonal produce. Using the "Just Say Yes to Fruits and Vegetables" curriculum, Stellar Farmers Market nutritionists provide free, comprehensive nutrition education workshops and cooking demonstrations at select farmers markets throughout NYC. Workshops include topics such as healthy eating, food resource management, food safety, and tips on saving money when food shopping. Participants over 18 years of age receive a $2 Health Buck coupon for attending the workshop. Learn more about the NYC Department of Health's Stellar Farmers Market program. Find a Greenmarket location near you that offers the Stellar Farmers Market program. Staff and volunteers from Cornell Cooperative Extensions Farmers Market Nutrition Education Program perform cooking demonstrations at our markets using seasonal ingredients to encourage consumption of locally grown fruits and vegetables and promote proper use of FMNP checks. 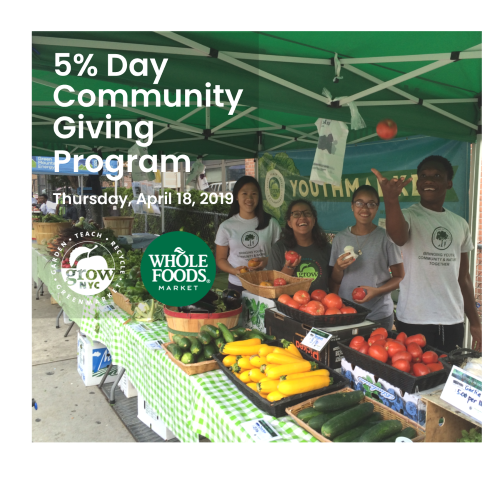 Their goals are to increase access to fresh fruits and vegetables, motivate participants to purchase and increase their consumption of these foods, and promote both New York State growers and the farmers markets where they sell their products. Learn more about Cornell Cooperative Extensions Farmers Market Nutrition Education Program. Find a Greenmarket location near you that offers the Cornell Cooperative Extension’s Farmers Market Nutrition Education program. Located in East Harlem, New York Common Pantry operates programming with the goal of reducing hunger and promoting self-sufficiency for food-insecure New York City residents. New York Common Pantry’s Live Healthy! program provides lessons on healthy eating and meal planning, including how to shop for seasonal produce and basic cooking and food safety skills. Learn more about New York Common Pantry programming. Find a Greenmarket location near you that offers New York Common Pantry's Live Healthy! program. If you are interested in applying for SNAP, visit an enrollment site near you. Another educational initiative supported by the New York City Department of Health and Mental Hygiene, Farmers Markets Kids operates free, bilingual activities for children focused on healthy eating. The goal of these hands-on activities is to teach children about the importance of good nutrition, learn about seasonal produce, and taste recipes featuring ingredients from the farmers market. Kids who participate in the free activities receive a $2 Health Buck coupon to spend on fruits and vegetables from the Greenmarket. Learn more about the Farmers Market Kids Program.